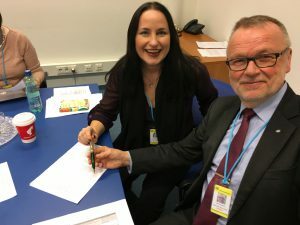 On the margins of the 61st CND the Vienna and New York NGO Committees signed the Memorandum of Understanding establishing the new Civil Society Task Force (CSTF) to ensure meaningful civil society participation in the process leading up to and during the ministerial segment 2019. Building on the successful experiences of Beyond 2008 and the UNGASS 2016, a similar structure has been approved for the Ministerial Segment of 2019 to serve as the official liaison between the United Nations and civil society in the preparatory process of and at UNGASS 2016. The CSTF’s overall goal is to secure a comprehensive and meaningful participation of civil society actors in the Ministerial Segment preparations. The CSTF is composed of 35 members representing geographical regions and affected populations. Updates about the activities of the Task Force will also be made available on the CSTF website. This entry was posted in CSTF, News, VNGOC. Bookmark the permalink.